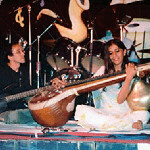 Guruskool is a voluntary focal centre for musicians around Bangalore and many musicians visiting India from other parts of the world. It was founded by Gopal and Geetha Navale. Here they collaborate, teach, perform, record and simply enjoy the music . Carnatic and Hindustani music classes are held at Guruskool. Among the dance forms at present Kathak and Bharatnatyam classes are conducted at the center. This place is created by a group of musicians with a vision to evolve a musical "esperanto" - a new common language of communication so that some of the great musical traditions of the world can meet, exchange notes and explore new frontiers.